In a highly calculated move to strengthen its grasp on power, the General Assembly passed six constitutional amendments to be placed on the ballot. This November, voters will decide the fate of these controversial provisions. These amendments are intentionally vague, deceptive, and misleading. Legislators have not provided us information about how any of them will be implemented. If we don’t know the full extent of what they will do, how can we make an informed choice? This amendment would create a 4-4 partisan deadlock on the state Board of Elections and Ethics Enforcement, hamstringing their ability to enforce the law and protect our right to vote. If we can’t vote, we can’t hold our elected leaders accountable, and they can get away with doing big polluters’ bidding. This amendment would let legislators appoint the judges who will rule on the constitutionality of their laws. This threatens our right to clean air and water, and the independence of our judiciary. This amendment would make North Carolina one of only two states with a voter identification provision in its constitution, along with Mississippi. Voter identification laws disproportionately impact low-income citizens, the elderly, and racial and ethnic minorities. Like with the previous two amendments, this would limit our ability to hold our leaders and polluters accountable. This amendment would not lower your taxes, but would handicap future leaders from funding basic services like environmental protections in times of crisis, like hurricanes or economic downturns. It would also pressure state lawmakers and local governments to raise other taxes and fees which disproportionately burden low-income citizens, including property and sales taxes. This amendment would grant additional rights to crime victims at the expense of the accused, who are frequently of low income. These rights are not under threat, and this amendment is unnecessary. 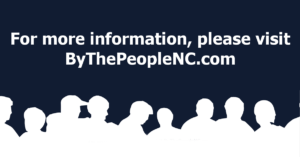 For more information, please visit ByThePeopleNC.com.